American jointvetch (Aeschynomene americana L.) is an annual tropical legume primarily used for pasture or in cut-and-carry systems. It can be cut for hay before maturity. In the wild, it is grazed by deers while quails, doves, and turkeys eat the seeds. It can also be used as a component of fresh water wetland reclamation seedings (USDA-NRCS, 2006). Some of its wood is used for rafts and floats. American jointvetch is an upright native forb or subshrub, annual to short-lived perennial legume, growing 0.5 to 2 m in height, depending on the ecotype. The stems are hairy, well-branched, about 1.5-2 mm in diameter and moderately leafy when young, somewhat woody and over 20 mm in diameter when maturing. The leaves are pinnately compound, about 3-8 cm long. 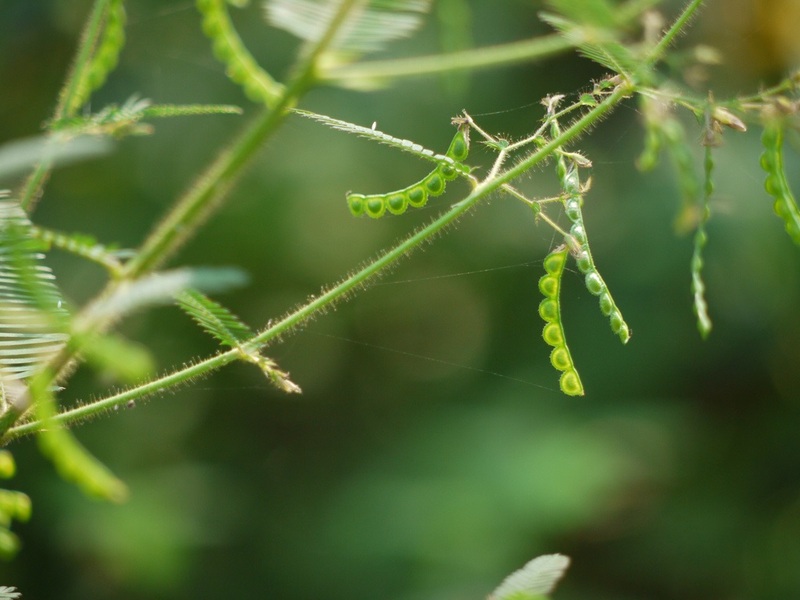 They bear 8 to 60 oblong to linear, ciliate leaflets, 3-15 mm long x 1-3 mm wide, grey green to dark green in colour, sensitive to light and touch, and thus folding on the rachis. The flowers are yellow-orange or yellow with dark lines or pinkish to pale mauve in colour. They appear as loose branched clusters (USDA-NRCS, 2006; Cook et al., 2005). The fruit is a slightly curved, segmented pod, up to 4 cm long containing 4-8 grey green to dark and light brown seeds. The level of hardseeds is about 60%, and dehulling helps to reduce hardseededness (FAO, 2017). Aeschynomene americana is a valuable source of fodder as it is high yielding and palatable to livestock and wild species. It is primarily used as a regenerating component of pastures or as an N-fixing pioneer plant. It can be sown in pure stands or in mixed pastures. It can be grazed, cut-and-carried, or green chopped (Cook et al., 2005). It may be cut and dried to make hay before maturity (USDA-NRCS, 2006). American jointvetch does well on wetlands and can be used as ley pasture in rice paddies (Bishop, 1992). It is a source of green manure (Bishop, 1992). In the USA, it is used to feed game and provides habitat to wild turkeys and bobwhite quail (Basinger, 2017). American jointvetch is a summer growing legume that originated from Central America, tropical South America and the Caribbean between 30°N and 30°S. It was introduced in the USA in the 1970s, in Australia in the 1980s, and later in South-East Asia, in Vietnam, Thailand, and the Philippines (Cook et al., 2005; Bishop, 1992). American jointvetch can be found from sea level up to an altitude of 2800 m in the tropics, but it grows mostly in lowlands of the subtropics corresponding to areas where average annual temperature ranges between 20 and 27°C and where annual rainfall is over 1000 mm (Bishop, 1992). 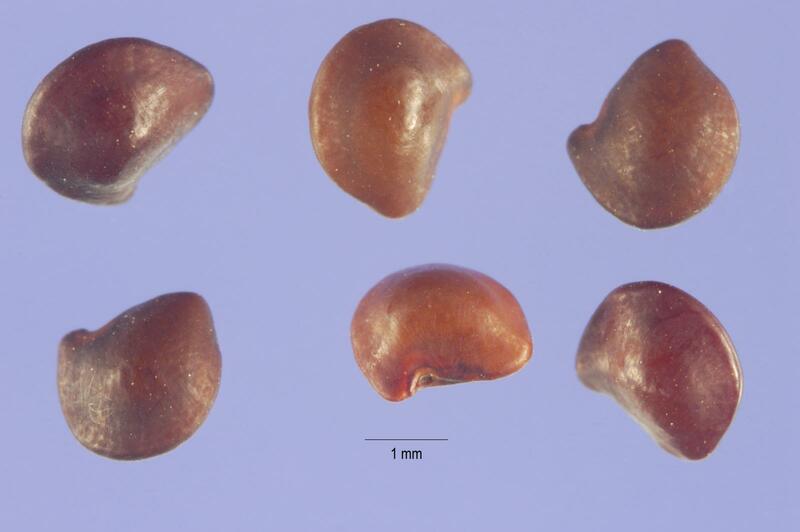 Aeschynomene americana can grow in a wide range of soils, from gravels to sandy clays with a pH ranging from 4 to 8 with moderate fertility provided they are finely textured and wet, poorly drained or waterlogged (Cook et al., 2005; Bishop, 1992). American jointvetch is suited to semi-shaded environments, including firebreaks, forest roads that do not receive much sunlight during the day (Basinger, 2017). It remains green with early light frosts, but heavier frosts can kill top material, and often the whole plant (Cook, 2007). American jointvetch is a high yielding legume. Yields up to 10-15 t DM/ha have been observed though average DM yields of 5 t/ha are more common (Cook et al., 2005). It was reported to yield 7.5 t hay/ha over 5 cuts in Puerto Rico, and 4.5 t/ha over 2 cuts in Florida (Bishop, 1992). Aeschynomene americana can be sown alone or in association with grasses such as pangola grass (Digitaria eriantha), milanje finger grass (Digitaria milanjiana), Guinea grass (Megathyrsus maximus), golden millet (Setaria sphacelata), bread grass (Brachiaria brizantha), signal grass (Brachiaria decumbens) or Koronivia grass (Brachiaria humidicola). It can be associated to other legumes such as pinto peanut (Arachis pintoi), centro (Centrosema molle), Desmodium heterocarpon, phasey bean (Macroptilium lathyroides), Vigna parkeri, or stylo (Stylosanthes guianensis) (USDA-NRCS, 2006; Cook et al., 2005). Rotational grazing of a stand of Bahia grass (Paspalum notatum)/american jointvetch resulted in higher in vitro OM digestibility and higher protein content of herbage (Gonzalez, 1990). If Aeschynomene americana is newly cultivated, it may be useful to inoculate seeds with cowpea rhizobium for N fixation. The plant should be sown in a well-prepared seedbed no deeper than 1-2 cm at 2-3 kg/ha of dehulled seeds, or 4-6 kg/ha seed-in-pod or when sown as a dehulled seed in mixed stands (USDA-NRCS, 2006; Cook et al., 2005). It may be useful to pack the soil after sowing. In rainfed conditions, it is recommended to sow it just before the onset of the rainy season (USDA-NRCS, 2006). It may be useful to dehull seeds to reduce hardseed level and improve germination. Since American jointvetch is rather slow to establish, some weeding/grazing operations are recommended at the beginning. In existing stands of American jointvetch or in mixed stands, some disking and chopping operations may improve the establishment of seedlings (Cook et al., 2005). Good pioneering stands could be obtained from seeds that had matured the previous year. In sites prone to flooding, it is recommended to have stands established before the rainy season as taller plants are more tolerant of flooding (USDA-NRCS, 2006). In wetlands, livestock should not graze Aeschynomene americana during the rainy season, because the animals cause trampling damages (Cook et al., 2005). American jointvetch is an annual legume that can be managed as a short-lived perennial provided seed setting is encouraged periodically. Stock should not enter the stand prior to flowering and should be allowed to come back once the seeds have been shed from the plants. American jointvetch should then be grazed heavily during the cold or dry season so as to favour new seedlings growth. Initial growth is rather slow, and plants may require up to 10 weeks to reach a height of 60 cm (Cook et al., 2005). New stands should not be grazed between 5 and 35-40 cm high (Hodges et al., 1982). A good grazing height for leaf canopy is reported to be about 50-60 cm. Aeschynomene americana is palatable and selectively grazed at all stages of active growth. Early grazing promotes dense basal branching and good leafy canopy. It can withstand continuous heavy grazing or rotational grazing with rest periods of 3 to 5 weeks. It does not provide good quality standover after summer (Cook et al., 2005). As Aeschynomene americana readily drops its leaves when mature, it is recommended to cut the green leafy plant at an early stage to make hay (Cook, 2007). To make haylage, the plants were cut at late bloom stage and let to wilt down to 50% DM. Cut forage was then chopped to 1.5 cm long sections and ensiled during 60 days without preservatives (Spicer et al., 1982). American jointvetch was reported to reduce nematode infestation in several studies where it had been planted as a summer crop. However, it was found that if the next crop was susceptible to host nematodes, the soil populations of nematodes were higher (Kokalis-Burelle et al., 2012). American jointvetch has a high protein content, ranging between 15 to 25% DM. Like in most plants, maturity decreases the protein content and increases the fibre content, thus reducing its nutritive value. In the late 1970s-early 1980s, several trials conducted in Florida investigated the relationship between its nutritional value and forage management, concluding that it was preferable to cut American jointvetch at early stages of growth in order to have maximum protein content and relatively low fibre content (Sollenberger, 1985). Highest yields of protein and in vitro digestible OM (IVDOM) were observed when the plant was first cut at 30 cm and regrowth was cut at 90 cm: protein concentration was 18.5% DM for plants cut initially at 30 cm, and 15.1% DM for those cut first at 90 cm (Kalmbacher et al., 1978). Keeping american jointvetch at 30 cm high throughout the season maintained protein content at 17.5% DM and resulted in IVDOM of 70% DM. Higher stand heights decreased IVDOM. A reduction of 8% DM in IVDOM was reported for each 30 cm increase of American jointvetch stand. Furthermore, cutting it to a height of 18 cm rather than 8 cm resulted in increased IVDOM by 2 to 5.5% DM because high quality forage is mainly hold in the top of the canopy (Mislevy et al., 1981). This was in accordance with earlier observation of 24% DM of protein in the top 15 cm of tall plants (Hodges et al., 1972). Young Aeschynomene americana has a high in vitro DM digestibility (over 50% for the stems, over 85% for the leaves and over 70% for the tops) but its digestibility decreases dramatically as the plant matures (Tobisa et al., 2000). American jointvetch harvested at the late bloom stage to make silage had only 10% DM of protein and as much as 74% DM of NDF. It was thus not recommended to use mature jointvetch to make haylage (Spicer et al., 1982). In 30- to 90-cm regrowth of Aeschynomene americana studied in Florida, potassium concentration declined linearly as initiation of cutting was delayed. Ca, P, and Mg concentrations showed little response to increasing maturity. Iron concentration increased linearly with plant age while that of Mn decreased. Zn and Cu concentrations were not affected by delaying cutting. With the exception of Cu, the needs of growing calves and yearlings should be met without supplementation (Kalmbacher et al., 1981). American jointvetch is palatable and well grazed by cattle and deers. Animals eat the young plants and the terminal branches and leaves of more mature forage (Sollenberger, 1985). As noted in Nutritional attributes above, the digestibility of Aeschynomene americana is high in the young plant (in vitro DMD of 85% in the leaves) and decreases afterwards. 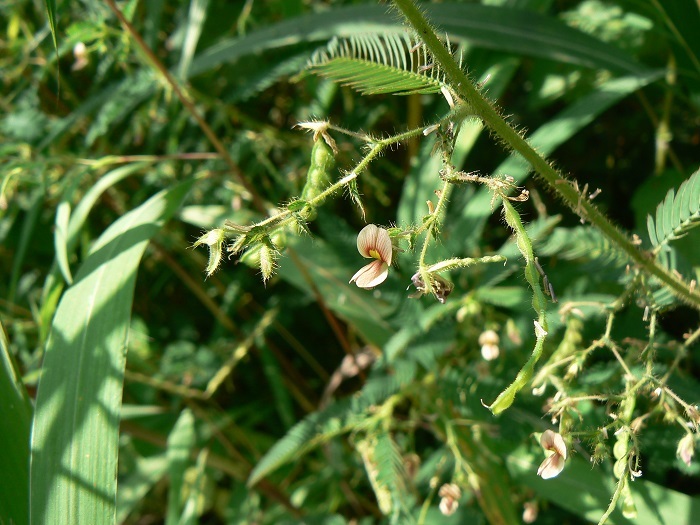 American jointvetch was reported to improve in vitro fibre digestion of a steer diet made of limpo grass (Hemarthria altissima), suggesting that it provides degradable N to the in vitro fermentation (Brown et al., 1991). Cows grazing a mixed stand of American jointvetch and Bahia grass to supplement pangola grass (Digitaria eriantha) pasture system had better calf weaning performance (82% on american jointvetch vs. 67% on pangola grass alone) while calves weights were similar and average calf production/ha was slightly higher with American jointvetch (Hodges et al., 1974). Beef production/ha was also slightly higher when the legume was included. Yearling heifers grazing American jointvetch had an average daily gain of 0.55 kg during summer (Hodges, 1977). Steers fed on limpo grass/American jointvetch mixed stands were reported to have 80 to 100% increase of average daily gain (ADG) (0.580 kg/d vs. 0.290 kg/d) during summer in comparison with animals fed on limpo grass only (Holderbaum et al., 1991). A similar trend was observed with yearling steers fed on Bahia grass supplemented with american jointvetch. Their ADG was 0.57 kg/d instead of 0.36 kg/d on bahia grass only, representing an increase of 56% in animal performance (Pitman et al., 1992). This was in accordance with similar experiment done in 1976 where steers on bahia grass/american jointvetch had 0.45 kg ADG while those on fertilized bahia grass only had 0.26 kg ADG (Hodges et al., 1976). Stocking rate up to 5.3 steers/ha was possible in mixed stands of Bahia grass and American jointvetch. Increasing stocking rate up to 5.3 steers/ha decreased ADG but kept increasing the gain per hectare, even during very wet warm season (Aiken et al., 1991a; Aiken et al., 1991b). American jointvetch and other summer annual legumes have been evaluated as creep graze for young calves. 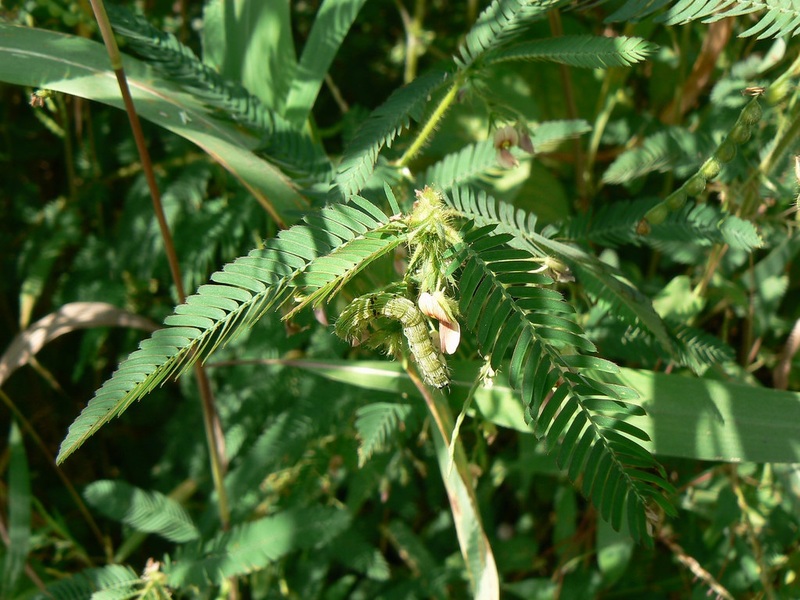 During 2 years, american jointvetch was the best forage and average daily gains were of 0.90 kg on American jointvetch, compared to 0.68 kg for the Bahia grass control (Ocumpaugh et al., 1981). American jointvetch sown in native pastures of Louisiana represented significant amount (32.4% of dietary DM) of free-ranging deer diets during summer. Daily intake of American jointvetch was 0.45 kg DM and resulted in higher CP, P, IVDMD and IVCaD of the diet (Keegan et al., 1989). No information found (as of 2017). Experimental plantations of Aeschynomene americana are sometimes grazed and partly destroyed by wild rabbits in Florida (Deren et al., 1989), which seels to indicate that fresh American jointvetch is palatable and non toxic for rabbits. However, feeding trials with domestic rabbits would be necessary before this plant can be recommended for rabbits.